"The Duo" is a period drama centered around two men who were switched at birth and goes on to live completely different lives. 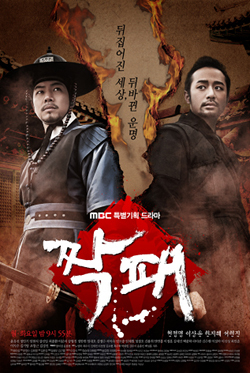 In the rich noble family Kim Jin-Sa (Choi Jong-Hwan), a baby is born but the mother dies after giving birth. Meanwhile, two slaves named Map-Soon and Soe-Dol runs away from their owner's home. Map-Son was raped her owner and pregnant at the time. In a beggar's hut, Map-Soon gives birth to a male baby. To feed the baby of Kim Jin-Sa, servants look for a woman who can breastfeed. Finally, they come to the beggars' hut and take Map-Soon away - saying she can come back after breastfeeding the baby of Kim Jin-Sa. Days pass, but Map-Soon is not able to leave. She stays at Kim Jin-Sa's home and works as a nanny. One day, Map-Soon switches babies to raise her birth son by herself. Chun-Dong (Chun Jung-Myung), who was born in the rich noble family, grows up in the poor beggars' hut. Gwi-Dong (Lee Sang-Yoon), who was born in the beggars' hut, now grows up in the rich noble family. "The Duo" takes over the MBC Mondays & Tuesdays 21:55 time slot previously occupied by "Queen of Reversals" and followed by "Miss Ripley" on May 30.
princecoolio Sep 08 2017 12:51 am Movie isn't great people, not worth watching twice. Get real. Who cares about the people playing their roles, doesn't make the movies better no matter,It's the script that counts. me this is maybe a 5 rated movie. 32 eps is to long for any movie series. dido May 19 2017 5:38 am it started so slow and ended abruptly where too many missings parts..but still it was good..i enjoyed watching the characters of soe-dol and keun-nyeon..great portrayal..ep 20 or 24 would have been enough for this drama..
Rina Feb 19 2014 5:20 am The drama is very good .. Although episodes long but this drama is never forgotten .. I like Gwi Dong .. I also love Lee Sang Yoon .. Lee Sang Yoon's acting is very good .. I always watch the drama that is Lee Sang Yoon ..
John Jul 05 2013 7:11 pm Interesting the the two most attractive female characters...played by HJH and YYS..from their respective generations also turn out to be the most self centered and shallow. I wonder if the Writers were trying to make a point here like Beauty only being skin deep. Their destestability is often so subtle, but they are pretty cold and heartless even though they obviously see themselves as victims. Gasenadi Feb 22 2012 2:55 pm What a poignant, compelling story! Highly recommend it.